You’ve been doing the finances of your business for far too long, and you recognize that it is costing you time and, in effect, money. 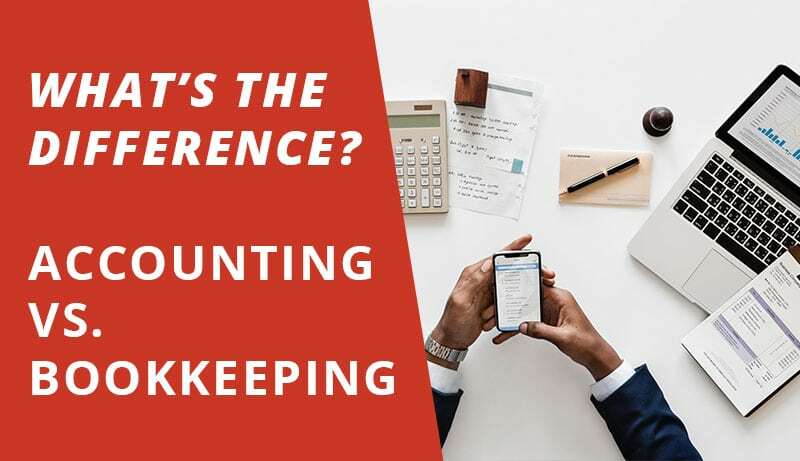 If you’ve been considering having a professional take over, you may be wondering exactly what the difference is between accounting services vs. bookkeeping services. If you’re in Las Vegas, we can help with your company’s books and finances. Bookkeeping and Accounting, on the surface, may seem like the same thing. In fact, while they are certainly related, they are really two different things that aim at a single goal. The goal, of course, is to find out if a business is making a profit. Every business has a purpose and the only way to fulfill that purpose is to make a profit so that the business can continue. Collecting day-to-day information about all the financial transactions a business will encounter on a timely and systematic basis. Organizing and categorizing that financial information. Ledger(s) – a summary of these items. Preparing timely reports, normally on at least a monthly basis (very large companies may do it daily or weekly), that summarize the results of a business’s operations and its financial health. Bookkeeping is the process that accountants use to perform their duties. Creating the set of books. Taking the information generated by the bookkeeping function and preparing reports that are in a format that is generally accepted by internal users (ownership/management) and external users (entities outside the business who nonetheless have an interest in its finances). Let’s expand on the role of the accountant, beginning with the type of users they serve. Ownership and management rely on financial information in various formats that tell them how to best manage the business. Depending upon the size of the business, they may rely on an internal accountant (normally called a Controller) to design and produce reports tailored to meaningfully present this information, in addition to a wide range of other internal financial management duties. If the business is not large enough to hire a Controller, they should still use an outside accountant, who will do this for a number of businesses, to help with at least some of the reporting duties. If a business isn’t large enough to hire a Controller, they may still want information to operate their business. An outside accountant can help by setting up a workable bookkeeping system that can be performed easily and monitored periodically by both the Owner/Manager and the accountant to find out what the numbers mean and how they can be used to manage the business. Most small businesses fall into this category: they don’t need a Controller yet, but they do need the insight that one could provide without all the duties of a person hired to do that job. External users include creditors, investors, various government agencies including or in addition to the Internal Revenue Service and state taxing agencies or anybody else who may have an interest in the financial well-being of the business. For this purpose, an independent accountant is almost always utilized and the financial reports generated are always expected to be in a format that is generally accepted and therefore readily understood by any external user because they are prepared under certain standardized rules and procedures developed over many years. While not always required, this accountant is usually a Certified Public Accountant or CPA. A CPA has special training, has passed a rigorous examination, has met certain experience requirements and has been licensed by the state in which they operate. In addition, they must engage in a certain amount of hours of continuing education each year. The Controller, mentioned above, is very often a CPA as well, but since they are not independent of the business for whom they work, they cannot prepare reports that will be relied upon by external users. The reports issued by an independent CPA for external users are either compiled, reviewed or audited (a discussion of which is very much beyond the needs of most small businesses and therefore beyond the scope of this discussion). Balance Sheet – shows the financial health of the business at any point in time. Income Statement (Profit or Loss) – shows the results of the operations of the business for a specified period of time (monthly, quarterly or annually) and determines whether or not the business is profitable and by how much. Does the business have enough capital to acquire assets that will promote the generation of profit? Are the assets protected by a strong system of internal controls? Is the business managing its cash flow? Is the business in a strong financial position (does it have more assets than liabilities)? Are taxes being legally minimized and are all filings up to date? Are there budgets in place and how is the company performing in relation to them? What plans are in place or can be made for exiting the business? To summarize, bookkeeping and accounting are related but different, approaching the same goal from different perspectives. Bookkeeping essentially is the recording of the financial information of a company, accounting is the formalization and interpretation of that information to help in the financial management of the company. A properly run company needs both so that it can maximize its profit, manage its cash flow, legally minimize its taxes and remain healthy so that it can continue and fulfill its purpose.